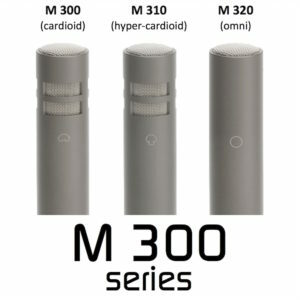 The M 300 (cardioid), M 310 (hyper-cardioid) and M 320 (omni-directional) are compact capacitor studio quality small diaphragm condenser microphones. 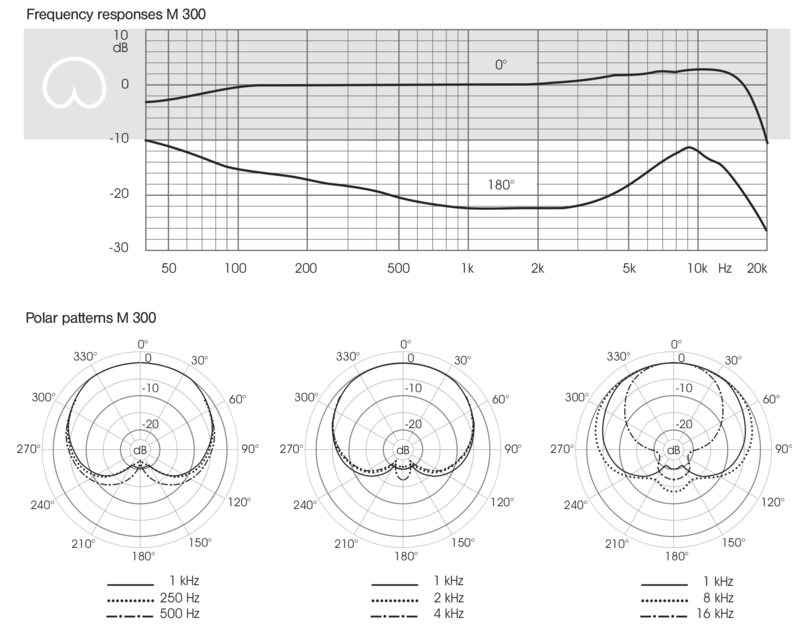 The microphones have a wide, smooth, frequency response that is practically linear for a wide range of sound incidence and have a smooth treble boost rising to about 3 dB between 6 and 10 kHz. 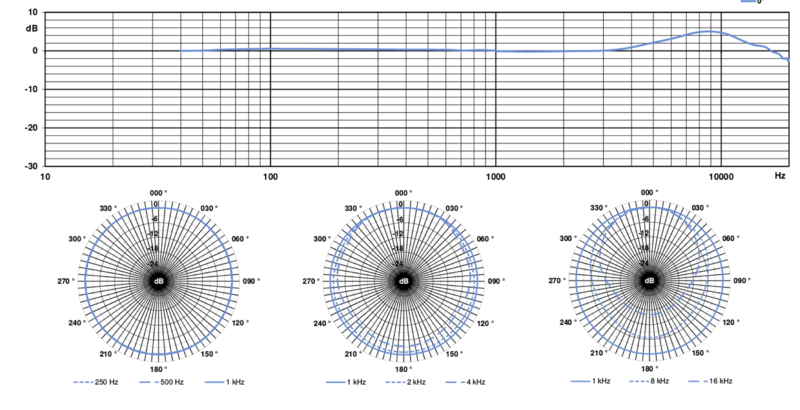 The bass end is excellent for pressure-gradient microphones, with the -4dB point being at a low 20Hz for the M 300. A new low-noise integrated hybrid circuit and the transformer-less circuit design ensure an extremely wide dynamic range with very low self-noise and high reliability in operation. The M3 capsule employed in these microphones has a 16mm gold-sputtered Mylar diaphragm. The capsule of the M 300 and M 310 is ceramic, rather than metal, to provide high consistency, whatever the temperature (a feature also used in Microtech Gefell’s range of very high-tolerance measurement microphones). The capsule is protected with a triple-layer wire-mesh grille at the front, and a dual-layer mesh for the rear-entry ports. To ensure the highest quality, the phantom power goes through a DC/DC converter to raise the voltage to 60V – this high polarising voltage makes for the microphone’s impressive SPL handling and keeps self-noise to a minimum. In addition, the polarising voltage is delivered to the capsule via an optical coupler, which decouples the supply, reducing ripple and virtually eliminates any phantom power supply noise and/or spurious interference. The electronics involve some clever optically isolated powering technology, in which a high‑intensity LED, driven directly from the phantom supply, illuminates a photocell which drives a DC‑DC converter. This innovative approach neatly isolates the capsule bias and impedance converter power rails from the phantom supply, which helps in achieving the very low noise floor. This effectively performs the task of a transformer without the ringing or bandwidth limitation that is usually associated. 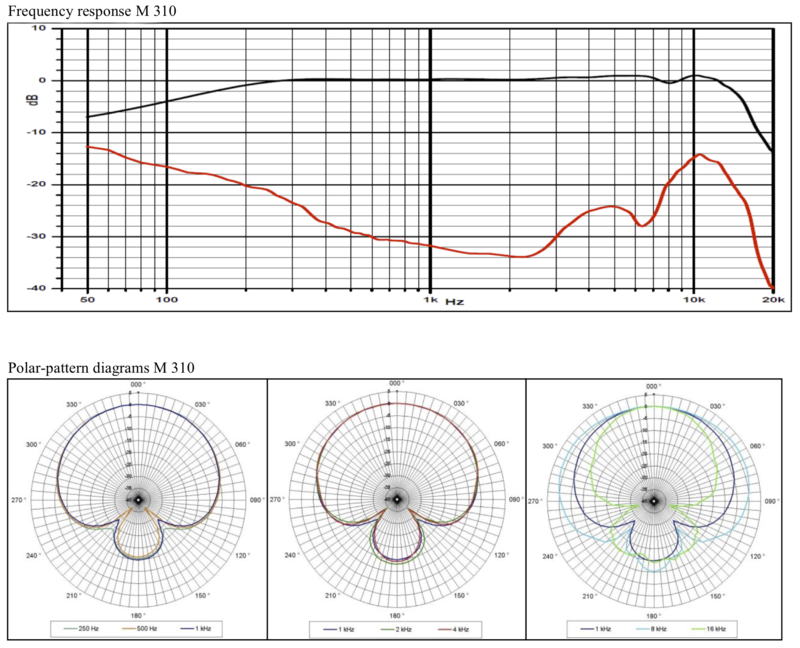 By providing pure DC to the capsule, you get both an improved performance and also a lower self-noise, most notably in the broadband spectrum. The RFI protection is high, making susceptibility to radio interference extremely low. The M 300 series is designed for studio applications in radio, television broadcasting and films for live performance and recording of instruments, vocals and speech and sound reinforcement in the professional and semi-professional market, also for use under adverse acoustic conditions (eg: churches, cathedrals and large auditoria). 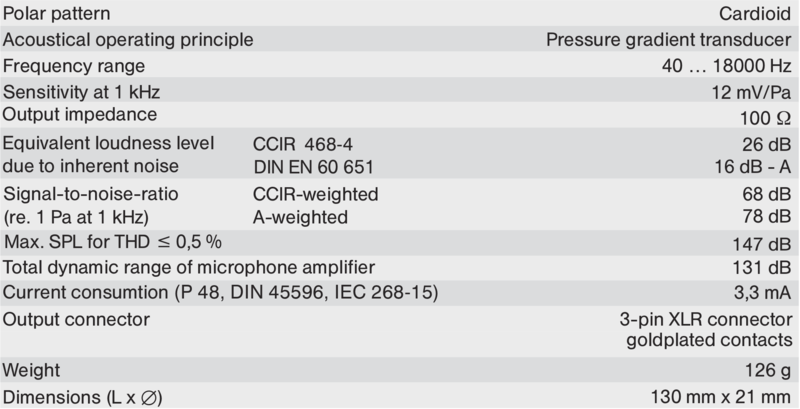 The microphone is connected via a 3-pin XLR connector and requires 48V phantom power according to IEC 286-15. The microphones are also available as a stereo set – supplied as a matched pair complete with MH 93 microphone mounts, stereo bar and riser (except the M 320, which does not have the stereo bar and riser). Please note that the single microphone does not come with the microphone mount, which has to be ordered separately (you can use the MH93, EH93, or a generic mount designed for 19mm Ø microphones). The M 300, M 310 & M 320 can also be used as a Boundary Microphone by using a “TURTLE” – for information on the TURTLE see HERE.